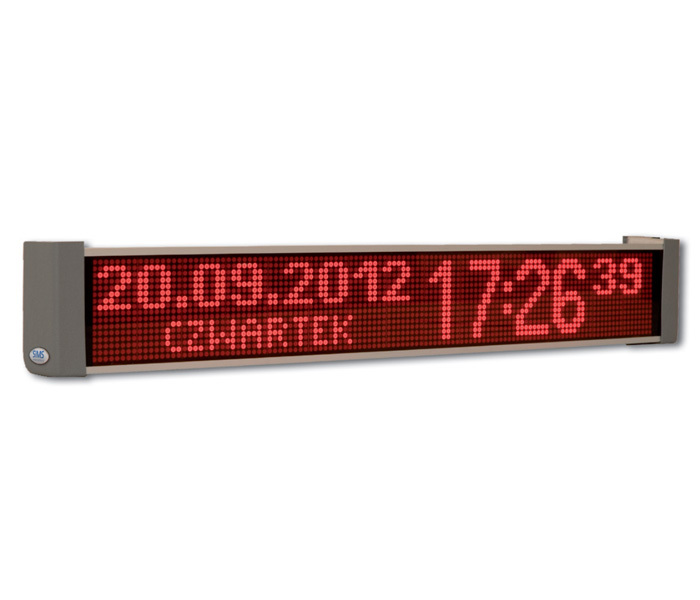 TML inside displays are components of the Passenger Information System mounted inside public transport vehicles. Information displayed on them is very important for the passenger, including name of route, name of stop, time and date, messages about blocking of ticket machines, and other texts or graphic presentations. The type of information displayed is unlimited and depends exclusively on the needs of the display user. Displays use red or green LEDs. TML displays are equipped with two-level brightness control, depending on the conditions of the outside lighting. Communication between the TML display and the control unit is conducted with the use of RS485 interface or a different transmission system selected by the customer. TML displays can be distinguished by their low weight and high resistance to outside factors. Due to high legibility, TML displays are used not only in vehicles, but also inside rooms as information and advertising displays.